From Calgary, follow Hwy 2 south to Aldersyde, turn left at the PetroCanada station onto 547 toward Mossleigh. Dinton is unmarked, about 5.0 km beyond the Blackie turnoff at the corner of Hwy 547 (also known as 370 Ave., SE) and 304th St. The ball field at the northwest corner of the intersection served as the drive-in theatre. From Carseland, go south on Highway 24, turn west on Highway 547, and drive 10.4 km. The ball field is to the right (north). Microscopic Dinton won’t be on your roadmap but it is easy to find. The ball field, which became Ennis and Alma’s drive-in theatre, is opposite St. Thomas’ Anglican Church (the Wedding Chapel). 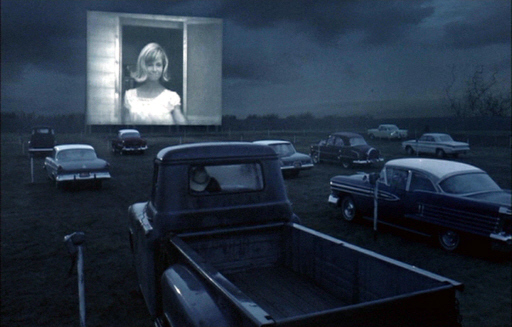 The drive-in is something of an illusion. A computer-generated theater screen is imposed on the image of the Dinton baseball diamond. The deception is perfected by speaker stands obtained from a Calgary drive-in. A few of the speaker-stand post holes remain. 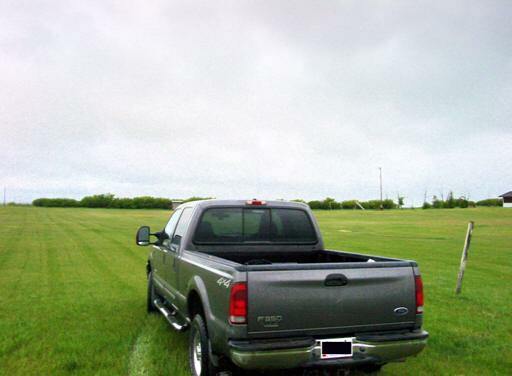 Ennis’s truck faced westward. While in Dinton be sure to see the Wedding Chapel (St. Thomas’ Anglican Church). It is just across the road!